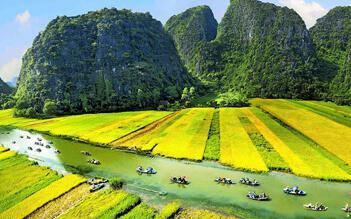 A journey through Vietnam and Laos will leave you energised and inspired. Encounter welcoming people throughout, including Buddhist monks in Luang Prabang. 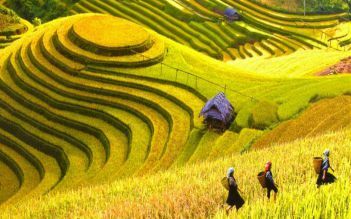 Uncover the vibrant cities of Saigon and Hanoi, explore historical Hoi An and Hue, then unwind on the banks of the Mekong in Vientiane and Luang Prabang. Take in the region’s breathtaking scenery, from mountainous regions to river life and sparkling bays. Arrive in Saigon and enjoy a welcome drink with your group. Gain an insight into the resilience of the Vietnamese people as you investigate the amazing Cu Chi tunnels before wandering along the city's historic Dong Khoi Street. Embark on a city tour, taking in sites including the Notre Dame Cathedral and War Remnants Museum. Wind your way through the canals of the Mekong Delta and visit local orchards. Fly north to Hue and discover its historic sites, including the Citadel and the Thien Mu Pagoda, before a visit to the Spiral Foundation. A spectacular drive brings you to Hoi An. Stop at traditional houses and temples, and see the iconic Japanese Bridge on a walking tour. Enjoy a free day in Hoi An for shopping and further exploration. Fly from Danang to Haiphong. Relax on a delightful drive to Halong Bay for your overnight cruise. Unwind as you cruise the bay, feasting on a delicious seafood lunch on board. Continue on to Hanoi, and enjoy a delightful water puppet performance. Visit the ancient Temple of Literature and 'Hanoi Hilton' prison before enjoying a group dinner with a local family in Hanoi. Fly to the Lao capital, Vientiane. Taste traditional Lao coffee at a local coffee shop in the morning, and then explore famous landmarks, such as the COPE Center, Wat Pha That Luang and the Patuxai Monument. Discover the art of Lao silk weaving during your visit to a weaving workshop, and late afternoon receive a unique welcome at a traditional Lao Baci ceremony in a local home. Fly to riverside Luang Prabang. Tour the beautiful Royal Palace and Wat Mai, and take part in a fascinating bamboo weaving experience. Help make your own dinner in a pavilion overlooking beautiful rice fields, to end the day. 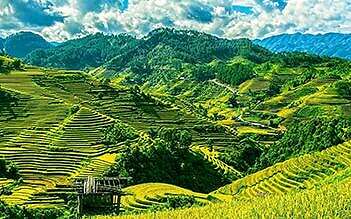 Take a morning walk through temple grounds and character-filled streets, then boat along the Mekong to the Buddha-filled Pak Ou Caves, set inside a towering cliff face. Rise early to witness the ancient ritual of local monks collecting alms. Explore a morning market, learn the art of making sticky rice, and visit the beautiful Kuang Si Falls. Play a game of petanque before a farewell dinner, and on your last day, spend time at leisure until your departure transfer. Tour finishes! The most memorable trip that I have taken in all my years of travel. The tour guides & drivers were professional, timely & spoke great Englsh. The Palaces, Temples, Ruins, Ha Long Bay cruise & river cruises were amazing. The architecture was stunning. Loved the tour. No negativity. Hotels were superior. It was a very relaxed, fun and amazing trip where you got to experience different cultures, people, transportations and lots of activities. Even though you stay in different cities, most for a maximum of two nights, you don't feel overwhelmed by it all or that you miss out. Our family of four (two teens, two parents), enjoyed this holiday tremendously. We were worried about bad toilet situations, getting food poisoning, pickpockets: there was none of that. Apart from the scooters in Hanoi we felt safe the whole time. The drivers were sensible, the local food (which we ate 98% of the time) was AMAZING, the shopping was fab, the guides were delightful, the people and activities were insightful / interesting and appropriate and we are very grateful we made the effort to do this trip.